NOTE: “Empty” and “Low Ink” alerts are COMPLETELY NORMAL for HP 22 ink cartridges which have been refilled! While at first this may be an unusual workflow, it does allow print operations to proceed. However, it is possible to reset the ink level monitor – refer to menu selections above for reset instructions. – Information Alerts. When a refilled ink cartridge is installed it is normal to receive alerts such as ‘non-genuine cartridge’ or ‘used color/black cartridge’. These may be bypassed by selecting ‘Dismiss’, ‘Ok’, or ‘Continue’. – Nuisance Messages. After a refilled ink cartridge is detected it is normal to receive alerts such as ‘low on ink’, ‘counterfeit’, ‘used’, ‘refilled’, or ‘depleted’ cartridge. These may be bypassed by selecting ‘Dismiss’, ‘Ok’, or ‘Continue’. – Severe Errors*. When an ink cartridge has poor connectivity (between contacts and flex cable inside printer) or is suffering from marginal internal micro-electrical performance, you may observe error messages such as ‘incompatible cartridges’, ‘print cartridges error’, ‘cartridge missing or not detected’, ‘refer to documentation’, ‘cartridge in left/right slot is missing’, etc. In addition, the power light or exclamation light (Officejet models) may be blinking while the error message is displayed. 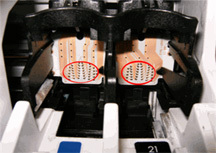 In some cases, errors can be cleared by removing and cleaning the ink cartridges and printer flex cable contacts. If not, then it is suggested to run the ‘cartridge health Tap 41 diagnostics’ check, internal test print or perform a cartridge error bypass (available on select printer models) to confirm that the ink cartridge is damaged. – Cartridge Electrical Failures. Severe cartridge errors are primarily caused by an electrical breakdown at the cartridge’s nozzle plate. Ink penetration or corrosion into the nozzle plate will cause a failure of the tiny micro-electronics resulting in a variety of different error messages being displayed. – Cartridge Diagnostics. The cartridge’s electrical health can be verified by running the ‘Tap 41’ diagnostics or internal test print at the printer’s control panel (NOTE: may not be available on all printer models). NOTE 1: Unfortunately, alignment pages and internal self test prints will usually print Ok even if the cartridge is internally electrically damaged. Do not use these test pages as a proxy for determining whether a cartridge is good or bad, only the ‘Tap 41/43’ diagnostic test report can yield this information. NOTE 2: As a temporary workaround for Deskjet printer models, or if you are unable to determine which cartridge is causing the issue, remove one of the ink cartridges from the printer….this may place the printer into the ‘single cartridge printer mode’….print jobs may then be executed from the computer (only). 2. Perform either of the ‘A’ procedures below as steps vary by printer model. Press the Setup Button located on the bottom center of the control panel, beneath the LED readout. Examine the resulting self-test page that prints. There should be lines extending all the way across the page in black, yellow, cyan and magenta. A missing black line indicates a problem with the black or photo cartridge. Faded, streaked or missing lines in the other colors indicates a problem with the color ink cartridge. Refer to video at link below to help evaluate test pattern. A good HP 21 black cartridge should have 416 good nozzles (26 x 16 stair-step pattern), while a good HP 22 color ink cartridge should have 300 good nozzles (100 for each color, 10×10 stair-step pattern). While holding down the Power button, open and shut the lid of the printer four times. Release the Power button. The self-test prints. Review test pattern; ensure all colors are firing. A missing horizontal line within the nozzle stair step pattern indicates a misfiring ink nozzle. Perform cartridge cleaning to correct. NOTE 3: When running the test on an HP Deskjet D2300/D2400 series printer it may be helpful to use a pen or pencil to hold down the Power button. Load plain, white paper into the paper tray. Press and hold the Cancel button, and then press the Start Copy Color button. The self-test report should print. If the self test page prints then this illustrates that the printer is functional and the problem is likely limited to either one of the ink cartridges. There should be lines extending across the page in black, yellow, cyan and magenta. A missing black line indicates a problem with the black or photo cartridge. Faded, streaked or missing lines in the other colors indicates a problem with the color ink cartridge. Remove either cartridge (not both). — If the computer message is Print Cartridge Error , then the print cartridge that is still in the printer is the problem cartridge. If the computer message is NOT “Print Cartridge Error” (instead, it says that the cartridge you have removed is “missing”, “not detected”, or “incorrectly installed”), then the cartridge you have removed is the problem cartridge. Press the Setup or Menu button until Print Report appears in the display then press Enter. Press the Setup or Menu button until Self-Test appears in the display, and then press Enter. Review test pattern; ensure all 4 colors are firing. A missing horizontal line within the nozzle stair step pattern indicates a misfiring ink nozzle. If the test page prints (or attempts to print a blank page) but normal printing is still not possible then the printer is functionally ok; the ink cartridge is damaged and will need to be replaced. Following the installation of a refilled ink cartridge, nuisance or annoyance messages will typically be displayed after the initial ‘low ink’ or ‘non-genuine’ ink messages. Step 3: Run a self-test and/or re-set the printer. Refer to Printer Model page (if available) or HP Printer Diagnostics page from the selections above. NOTE 2: All integrated cartridges being repeatedly refilled eventually do fail. Some cartridges/printers may encounter an unavoidable mechanical or electrical failure which is unrelated to refilling. Check for physical damage on the cartridge. Look at the print cartridge and see if there are any cracks, tears or missing elements. Any one of these can cause a failure. In these cases, you will need to purchase a new cartridge and start the refill process again after it has run out. CAUTION: Be advised, the use of compatible/clone cartridges (i.e. knockoffs sold thru the internet from overseas) are known to be problematic and may cause printer errors. We do NOT suggest refilling these types of ink cartridges…..refilling of original/genuine ink cartridges is only suggested!